This book has been left in OBCZ Hotel de Jonge. Thanks for the donation! Back cover with description of the book. 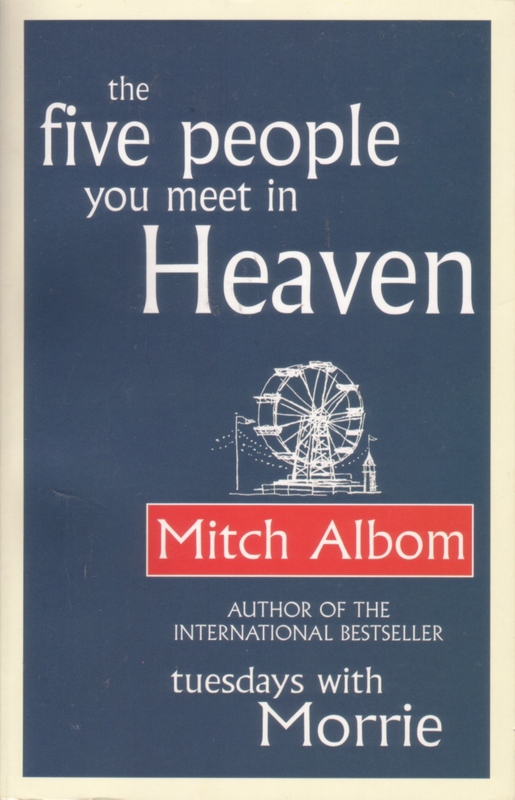 Part melodrama and part parable, Mitch Albom's The Five People You Meet in Heaven weaves together three stories, all told about the same man: 83-year-old Eddie, the head maintenance person at Ruby Point Amusement Park. As the novel opens, readers are told that Eddie, unsuspecting, is only minutes away from death as he goes about his typical business at the park. Albom then traces Eddie's world through his tragic final moments, his funeral, and the ensuing days as friends clean out his apartment and adjust to life without him. In alternating sections, Albom flashes back to Eddie's birthdays, telling his life story as a kind of progress report over candles and cake each year. And in the third and last thread of the novel, Albom follows Eddie into heaven where the maintenance man sequentially encounters five pivotal figures from his life (a la A Christmas Carol). Each person has been waiting for him in heaven, and, as Albom reveals, each life (and death) was woven into Eddie's own in ways he never suspected. Each soul has a story to tell, a secret to reveal, and a lesson to share. Through them Eddie understands the meaning of his own life even as his arrival brings closure to theirs. Albom takes a big risk with the novel; such a story can easily veer into the saccharine and preachy, and this one does in moments. But, for the most part, Albom's telling remains poignant and is occasionally profound. Even with its flaws, The Five People You Meet in Heaven is a small, pure, and simple book that will find good company on a shelf next to It's A Wonderful Life. --Patrick O'Kelley. This life-affirming fable ironically opens at the end of the life of a seemingly ordinary man. Known as "Eddie Maintenance" to those he works with at Ruby Pier, Eddie led what he saw as a disappointing life working as head of maintenance at a seaside amusement park. Upon his death, he learns that heaven is a place to make sense of his time on earth and that he will meet five people from his life who will help him understand its greatest lessons. Accompanied at times by music that sounds psychedelic rather than heavenly, reader Singer conveys this uplifting story in an earnest manner. However, the soft-spoken intonations he employs for women and the gruff but bashful voices he uses for men add an extra dose of sweetener to this already sentimental tale, as does Singer's plaintive rendition of Eddie and his wife Marguerite's song, "You made me love you." 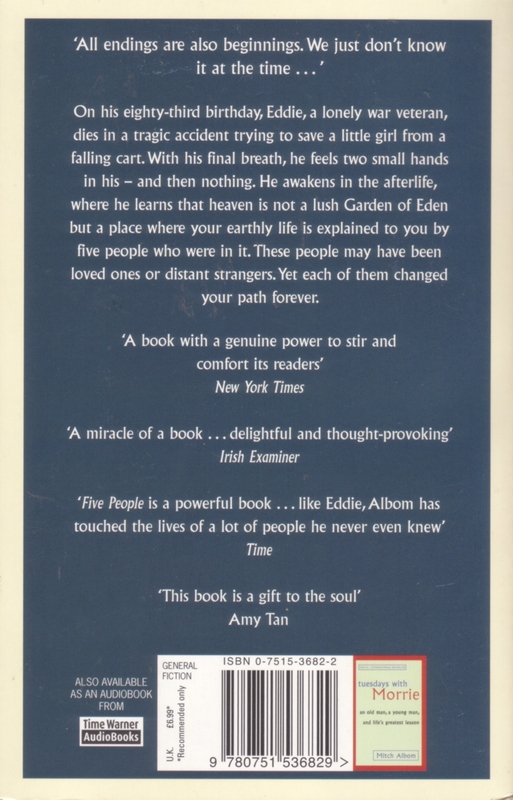 Still, those who turn to this audio book for Albom's (Tuesdays with Morrie) musings on the meaning of life will not be disappointed. Copyright © Reed Business Information, a division of Reed Elsevier Inc. All rights reserved. "I'm especially proud to have an audio version of this book, since it harkens back to the way my first stories came to me--not by the written page, but by other people's voices." That's Mitch Albom himself in his introduction. This writer's commitment to the aural tradition is clearly demonstrated in the sophistication with which his book is presented. Erik Singer's virtuoso performance is set off with musical interludes and background noises that are diverting but never distracting. The teaching parable is built around an 83-year-old war vet turned maintenance man who dies trying to save the life of a little girl. This is at the Ruby Point Amusement Park. "All endings are also beginnings. We just don't know it at the time..." B.H.C. 2004 Audie Award Finalist © AudioFile 2004, Portland, Maine-- Copyright © AudioFile, Portland, Maine. Albom, newspaper columnist and radio broadcaster, is, of course, best known as the author of the astonishingly successful Tuesdays with Morrie (1997). This is his first novel. With an appropriately fable-like tone, Albom tells the story of Eddie, "an old man with a barrel chest." But for us, Eddie's story "begins at the end, with Eddie dying in the sun"--at Ruby Pier, an amusement park by the sea, where he spent most days, for despite his advanced years, he worked as a maintenance man on the rides. He dies on his eighty-third birthday trying to save a little girl from an accident. Eddie wakes up in heaven, where he is informed that "there are five people you meet in heaven. Each ... was in your life for a reason. You may not have known the reason at the time, and that is what heaven is for. For understanding your life on earth." And, not surprisingly, this is what the novel is about: Eddie coming to appreciate his 83 years of mortal life; the novel's "point" is that apparently insignificant lives do indeed have their own special kind of significance. A sweet book that makes you smile but is not gooey with overwrought sentiment. Brad Hooper Copyright © American Library Association. All rights reserved. Eddie is a wounded war veteran, an old man who has lived, in his mind, an uninspired life. His job is fixing rides at a seaside amusement park. On his 83rd birthday, a tragic accident kills him as tries to save a little girl from a falling cart. He awakens in the afterlife, where he learns that heaven is not a destination. It's a place where your life is explained to you by five people, some of whom you knew, others who may have been strangers. One by one, from childhood to soldier to old age, Eddie's five people revisit, their connections to him on earth, illuminating the mysteries of his "meaningless" life and revealing the haunting secret behind the eternal question: "What was I here?" 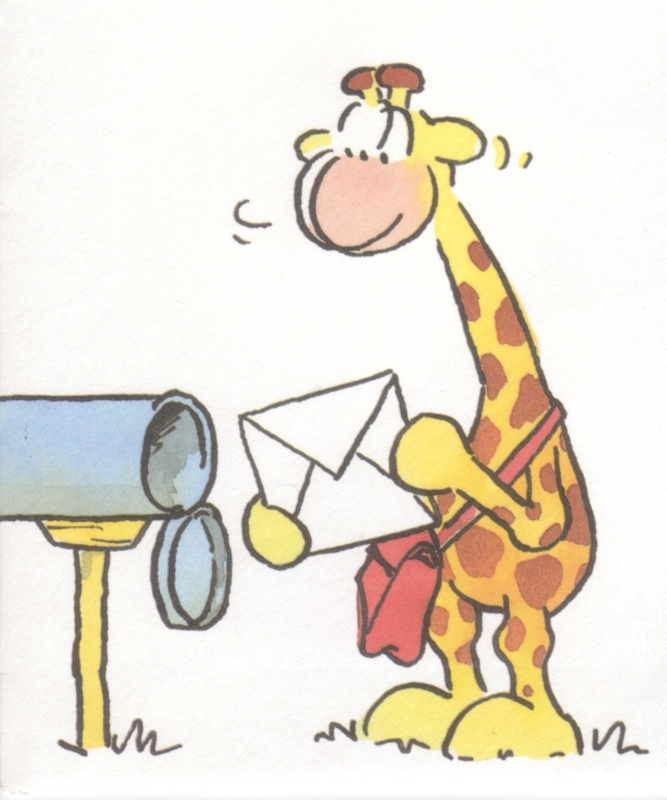 Given to dutch-flybaby to send to another bookcrosser. I wanted to give this book to biba89 at the Deventer bookmarket, but I'm not up to going there this year. Instead I'll mail it to her today. Happy reading biba89! What a lovely surprise! Thank you Dutch-flybaby and sorry not to see you at the meetup in Deventer. This is very sweet. I will read it soon. 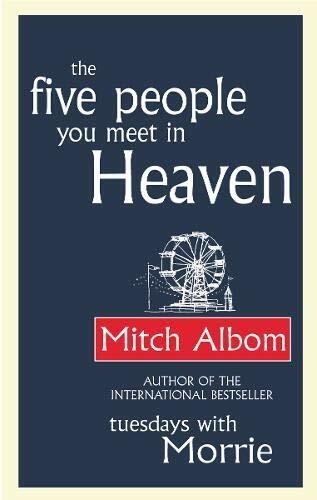 First, it appeared to me that Mitch Albom was trying to imitate Stephen King's writing style. I found this a little irritating, which prevented me to really get into the story. But now that I have finished it, I realise the story has gotten under my skin after all. I find the idea in it soothing and comforting in some way. Thank you! Naar de OBCZ in het Meester Geertshuis. gevonden in OBCZ de Ulebelt in Deventer. Intrigerende titel, ben benieuwd naar de inhoud. Mening volgt..